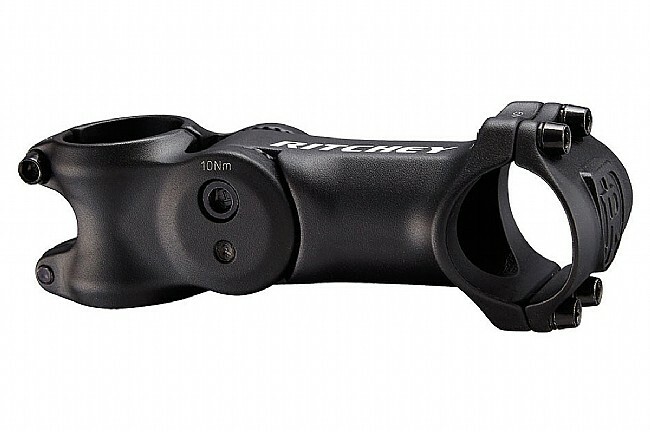 Dial in your perfect fit wth the Ritchey Adjustable Road Stem! Full adjustability in a high quality design. 30mm tilt-adjustment at steerer clamp offers up to 45 degrees of height adjustment in either direction. Fits 1 1/8" threadless steerer tubes. I purchased this stem 5 years ago after returning from a 6-year hiatus from riding due to a neck injury. I needed to sit in a more upright position to acclimate to riding again. After a few months, I was able to lower the stem, and a year later, lower it again. I've put thousands of miles on it since and it's still going strong. Bought this to make one of my bikes a little more comfortable,I wanted to sit a bit more upright. Worked great, installed easy and looked good on top of it.This stem is built very well, you would be hard pressed to break it. Using this on my Focus TT ... after a fitting, it was determined that I needed a shorter stem then what came stock on the bike and this was pretty much all that Western had in stock that would work. Does provide me the ability to raise and lower my position without having to play swap-a-stem, though it's not a simple process. And it's a Ritchey, a brand I've used and trusted for years. On a bike where fit is critical, we've found some riders prefer to use the adjustable Ritchey stem for a while to fine tune body position before committing to a regular fixed stem in the length and angle that works best for them. As we all get olderstiffer, raising the bars is a nice antidote to stiff necks and backs and shoulders and such. While a bit on the heavy side, this stem provides a nice tool for dialing in a friendlier bar position before buying a new fixed stem, particularly if one rides legacy gear with dimensions which are sufficiently unfashionable that most available stems also require new bars. Note that the description Over 45 degrees of height adjustment in either direction. is rather poorly worded. Height adjustment is of course not measured in degrees, but in mm. The range of angle adjustment then is not 45 degrees in either direction from the horizontal, the customary reference, but from the angle of the head tube, leaving a bit less than 30 degrees of adjustment upwards for typical road bike geometry, the max amount of height change upwards is then the length of the stem from the pivot point to the bar center times the sin of the angle from horizontal, i.e. a bit less than 0.5 x (stem length - 30). In any event I just wound up cranking it up all the way, in the spirit of if a little bit is good, more is better. I found this stem rock solid once mounted, consistent with reviews found elsewhere. heavier than the Thomson low rise . ANd my bidke mechanic says it is not carbon compatible. I will be returning it. 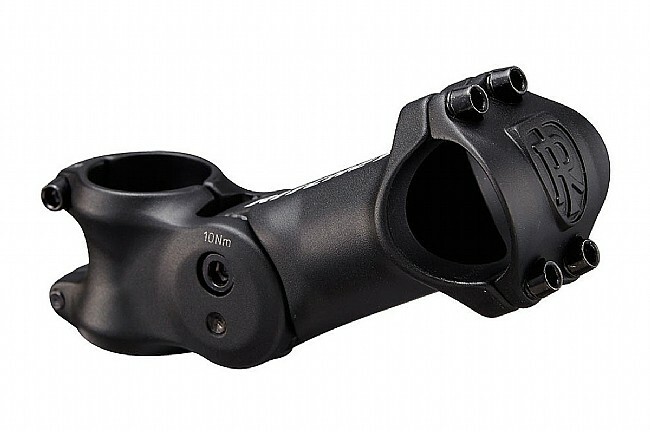 Ritchey Adjustable Angle Road Stem is a solid product allowing the desired handle bar angle adjustment. One has to be aware of the potential required changes in the cable housing of brake and gear cables (not required in my case). This is mainly due to the change in the reach length of cables. One should also be prepared to take the clamps off to be able to change the angle. My goal was to have a flexible solution for experimentation before switching to a permanent fixed stem and Ritchey Adjustable Angle Road Stem addressed my need. Solves any problem raising or lowering bars for comfort, but I found the pivot bolt, if not really tight, will make a creaking noise when you pull on the bars when climbing. For quite some time, I thought the noise was caused by the handlebar clamp because the noise I s transferred, so it sounds as if it is coming from somewhere else. 21 of 22 customers found this review helpful. My hands and neck were getting sore on long rides. I thought if I could lift my handle bars up it would take some pressure off my hands. The adjustable stem has made it much more comfortable. I am kind of new to longer rides, so I am always tweaking my bike fit to find the sweet spot. I like how the adjustable stem gives me more options. The construction is really high quality. The way it locks into place is rock solid.